After finding that the pineal gland is a major target for fluoride accumulation in humans, Dr. Luke conducted animal experiments to determine if the accumulated fluoride could impact the functioning of the gland - particulalry the gland's regulation of melatonin. Luke found that animals treated with fluoride had lower levels of circulating melatonin, as reflected by reduced levels of melatonin metabolites in the animals' urine. This reduced level of circulating melatonin was accompanied - as might be expected - by an earlier onset of puberty in the fluoride-treated female animals. "In conclusion, the human pineal gland contains the highest concentration of fluoride in the body. Fluoride is associated with depressed pineal melatonin synthesis by prepubertal gerbils and an accelerated onset of sexual maturation in the female gerbil. The results strengthen the hypothesis that the pineal has a role in the timing of the onset of puberty. Whether or not fluoride interferes with pineal function in humans requires further investigation." SOURCE: National Research Council. (2006). Fluoride in Drinking Water: A Scientific Review of EPA's Standards. National Academies Press, Washington D.C. p221-22. "It is remarkable that the pineal gland has never been analysed separately for F because it has several features which suggest that it could accumulate F. It has the highest calcium concentration of any normal soft tissue in the body because it calcifies physiologically in the form of hydroxyapatite (HA). It has a high metabolic activity coupled with a very profuse blood supply: two factors favouring the deposition of F in mineralizing tissues. The fact that the pineal is outside the blood-brain barrier suggests that pineal HA could sequester F from the bloodstream if it has the same strong affinity for F as HA in the other mineralizing tissues. The intensity of the toxic effects of most drugs depends upon their concentration at the site of action. The mineralizing tissues (bone and teeth) accumulate high concentrations of F and are the first to show toxic reactions to F. Hence, their reactions to F have been especially well studied. If F accumulates in the pineal gland, then this points to a gap in our knowledge about whether or not F affects pineal physiology. It was the lack of knowledge in this area that prompted my study." "After half a century of the prophylactic use of fluorides in dentistry, we now know that fluoride readily accumulates in the human pineal gland. In fact, the aged pineal contains more fluoride than any other normal soft tissue. The concentration of fluoride in the pineal was significantly higher (p <0.001) than in corresponding muscle, i.e., 296 ± 257 vs. 0.5± 0.4 mg/kg (wet weight) respectively." "In terms of mineralized tissue, the mean fluoride concentration in the pineal calcification was equivalent to that in severely fluorosed bone and more than four times higher than in corresponding bone ash, i.e., 8,900 ± 7,700 vs. 2,040 ± 1,100 mg/kg, respectively. The calcification in two of the 11 pineals analysed in this study contained extremely high levels of fluoride: 21,800 and 20,500 mg/kg." Fluoride & Pineal Gland - Analagous to Dental Fluorosis? "Fluoride is now introduced at a much earlier stage of human development than ever before and consequently alters the normal fluoride-pharmacokinetics in infants. But can one dramatically increase the normal fluoride-intake to infants and get away with it? The safety of the use of fluorides ultimately rests on the assumption that the developing enamel organ is most sensitive to the toxic effects of fluoride. The results from this study suggest that the pinealocytes may be as susceptible to fluoride as the developing enamel organ." "Alongside the calcification in the developing enamel organ, calcification is also occurring in the child's pineal. It is a normal physiological process. A complex series of enzymatic reactions within the pinealocytes converts the essential amino acid, tryptophan, to a whole family of indoles. The main pineal hormone is melatonin (MT)... If F accumulates in the pineal gland during early childhood, it could affect pineal indole metabolism in much the same way that high local concentrations of F in enamel organ and bone affect the metabolism of ameloblasts and osteoblasts." "Any adverse physiological effects of fluoride depend upon the concentration at various tissue sites. Can pinealocytes function normally in close proximity to high concentrations of fluoride? One would predict that a high local fluoride concentration would affect pinealocyte function in an analogous way that a high local fluoride concentration affects: i) bone cells, since histological changes have been observed in bone with 2,000 mg F/kg (Baud et al, 1978); ii) ameloblasts, since dental fluorosis develops following fluoride concentrations of 0.2 mg F/kg in the developing enamel organ (Bawden et al, 1992). The consequences are disturbances in the functions of bone and enamel, i.e., changes in structure (poorly mineralized bone and enamel). If the pineal accumulates fluoride at an earlier age than in previous decades, one would anticipate that a high local concentration of fluoride within the pineal would affect the functions of the pineal, i.e., the synthesis of hormonal products, specifically melatonin... The controlled animal study carried out in this study produce compelling evidence that fluoride inhibits pineal melatonin output during pubertal development in the gerbil." "The section on the effects of fluoride on the physiological signs of sexual maturity in the gerbil was a preliminary, pilot study. There were not enough subjects to make any firm conclusions so an interpretation of the data is conjectural. However, the results do suggest that the HF (High-Fluoride) females had an accelerated onset of puberty as judged by several indices of pubertal development in rodents. At 7 weeks, the HF females were significantly heavier than the LF females (p < 0.004); as heavy as the HF males and LF males. The ventral gland in the HF female developed significantly earlier than in the LF female (p < 0.004). Vaginal opening occurred earlier in the HF female than in the LF female (p <0.03)." Fluoride & Pineal Gland - Earlier Puberty in Humans? "The first step in assessing a health risk by a substance to humans is the identification of its harmful effects on animals. A health risk to humans is assessed using results from human epidemiological studies in conjunction with results from animal studies. The Newburgh-Kingston Study (Schlesinger et al, 1956) showed an earlier age of first menarche in girls living in the fluoridated Newburgh than in unfluoridated Kingston. The current animal study indicates that fluoride is associated with an earlier onset of puberty in female gerbils. Furthermore, more research was recommended on the effects of fluoride on animal and human reproduction (USPHS, 1991). This project has contributed new knowledge in this area." "The most plausible hypothesis for the observed significant decrease in the rate of urinary aMT6s excretion by the HF (High-Fluoride) group is that fluoride affects the pineal's ability to synthesize melatonin during pubertal development in the gerbil. Fluoride may affect the enzymatic conversion of tryptophan to melatonin. Although melatonin was the hormone investigated in this project, fluoride may also affect the synthesis of melatonin precursors, (e.g., serotonin), or other pineal products, (e.g., 5-methoxytryptamine). This would depend on the position(s) of the susceptible enzyme(s). For some unknown reason, pineal calcification starts intracellularly. Calcium has been demonstrated in pinealocyte mitochondria. Therefore, it may be a mitochondrial enzyme that is sensitive to the effects of fluoride, e.g., tryptophan-5-hydroxylase. Alternatively, fluoride may affect pinealocyte enzymes which require a divalent co-enzyme because such enzymes are particularly sensitive to fluoride." "Fluoride is now introduced at a much earlier stage of human development than ever before and consequently alters the normal fluoride-pharmacokinetics in infants. In conclusion, the human pineal gland contains the highest concentration of fluoride in the body. Fluoride is associated with depressed pineal melatonin synthesis by prepubertal gerbils and an accelerated onset of sexual maturation in the female gerbil. 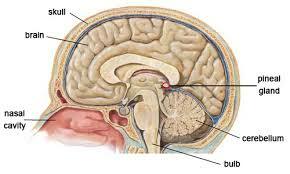 The results strengthen the hypothesis that the pineal has a role in the timing of the onset of puberty. Whether or not fluoride interferes with pineal function in humans requires further investigation."